Since its founding in 1970, Newman Myers Kreines Gross Harris, P.C. has been in the vanguard of distinguished and innovative service in the representation of business interests, insurance companies, and municipal agencies in New York and New Jersey. 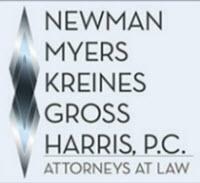 Newman Myers Kreines Gross Harris, P.C. excels in all facets of the litigation of claims involving personal injury, death, and property loss. The firm appears in Martindale-Hubbell's Bar Register of Preeminent Lawyers and Best's Directory of Recommended Insurance Attorneys. sophistication, readiness and aggressiveness at trial. We offer expertise in construction accident litigation, premises liability, property damage, transportation accidents including trucking, bus and automobile law, product liability, insurance coverage litigation, professional liability, first party claims, environmental and toxic torts, and appellate advocacy. The firm boasts a formidable track record of successful results for its clients at trial, in motion practice, and in insurance cost recovery and risk transfer proceedings. Our highly experienced appellate practice group has set standards for success and legal scholarship, and the names of the firm's attorneys stand proudly beside scores of seminal decisions in the appellate courts.